The Forbidden City is BIG. After walking around its whole length along its perimeter wall and moat, we finally reached Tiananmen Square: there is where the South entrance to the Forbidden City is located, under a gigantic portrait of Chairman Mao, Mona Lina smiling at the long line of tourists clearing the security check leading to the red plastered walls of the monumental Gate of the Heavenly Peace. 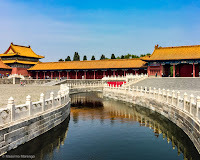 The Forbidden City had been the seat of Chinese imperial power for almost 500 years, until the 1912 abdication of Puyi, the last emperor of China. For the following twelve years the last emperor was confined in the Inner Court of the sprawling complex, while the Outer Court was, for the first time in history, opened to the public. This arrangement ended in 1924, when a coup ended once and for all the Qing dynasty and the imperial rule in China. The Japanese invasion, and then the Chinese Civil War caused many of the treasures in the Forbidden City to be evacuated. Much was returned at the end of War War II, but a small but highly valuable part of the collection is still missing, kept in the National Palace Museum in Taipei. In the years following the establishment of the People's Republic of China the palace was left in disrepair, and sometimes directly threatened of destruction, as during the Cultural revolution when in the eyes of the revolutionary zeal it became a symbol of the overthrown oppressive imperial power. It was only saved when the premier Zhou Enlai sent an army battalion to defend the city. 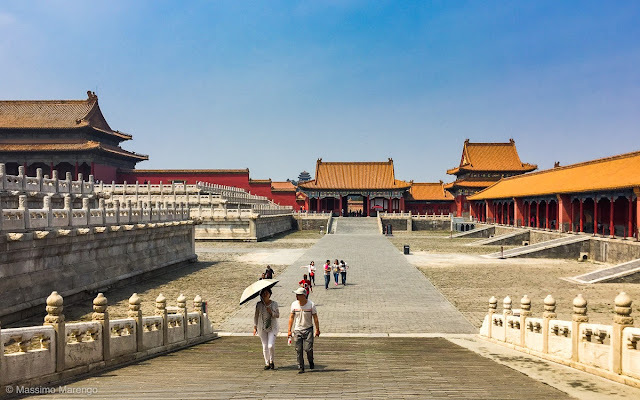 In 1987 the Forbidden City was declared a World Heritage site and the Chinese government has finally recognized its cultural (and economic, given its value as a touristic attraction) importance. 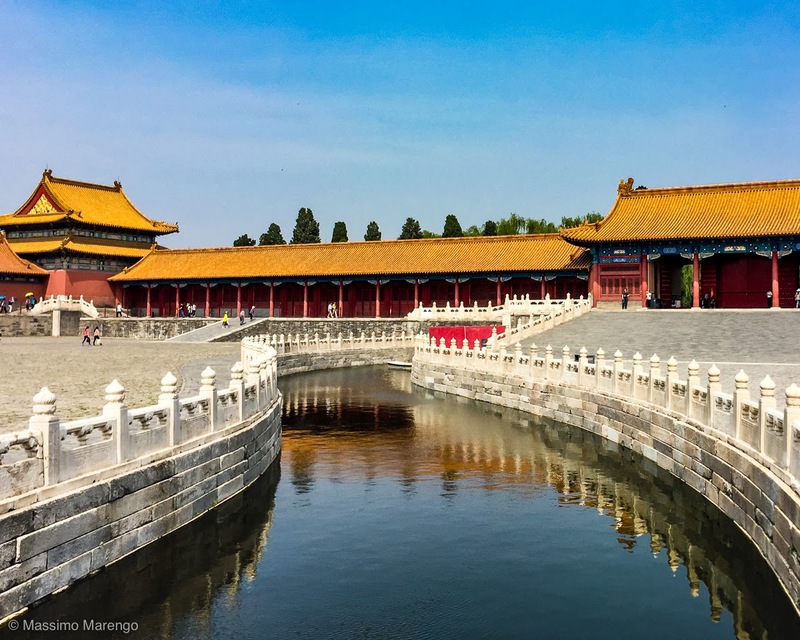 Now administered by the Palace Museum, it is undergoing a massive restoration project aimed to bring back the splendor of its buildings in their pre-1912 state (much has been already done, but we could see areas still fenced off as the works continue). Even though only part of the complex is open to the public, the sheer size of the structure is too much to be visited in a single day. One walks from courtyard to courtyard, passing under one gate after the other in what is the largest collection of preserved ancient wood structures in the world. The courtyard opening on the Meridian Gate is so expansive that a wide canal flows through it, crossed by 5 marble bridges (the Inner Golden River, small photo on the left). With 14.6 million annual visitors (for what I could see, a large fraction of them are Chinese nationals, or come from nearby asian countries) it is the most visited museum in the world.